Hakka Noodles, a very basic and popular recipe belongs to Indian Chinese Cuisine. Mixed vegetables and cooked noodles are quickly stir fried and tossed with sauces in Indo-Chinese style. It is really easy and quick to prepare. If served with Gravy Manchurian or spiced schezwan vegetables makes it a perfect complete meal. Follow the Ez recipe below to make Vegetarian Hakka Noodles. This milky tea(chai), lightly spiced with ginger, cardamom, cloves, pepper and cinnamon is drunk all over India. It is generally a hot beverage made by brewing tea leaves with Indian Spices and herbs. It instantly refresh the tired mind and fuel the body to boost energy. Making tea with home made chai masala brings out excellent flavors. I love to sniff the Masala chai with every sip. I'm a great addict to tea and I cannot stay even a single day without slurping my cup of tea. What to do I had been grown up my mom in such a way. MH who never use to have coffee or tea before marriage is now screwed to tea lover by me. And now he has become a real fan for my Tea. Whenever he is at he asks me to make tea, see how I changed him. Making homemade chai masala is as simple as with more or less Indian spices. I here used ginger, cardamom, cloves, pepper and cinnamon for masala. You can include more spices like star anise, fennel seeds. Crush all together in a mortar / processor, add to the tea. Each of these spices has special health benefits in itself. 1.First prepare chai masala: grind together all ingredients under "For Chai Masala" to coarse powder. Store this masala in a container and use when and as needed to make masala chai. 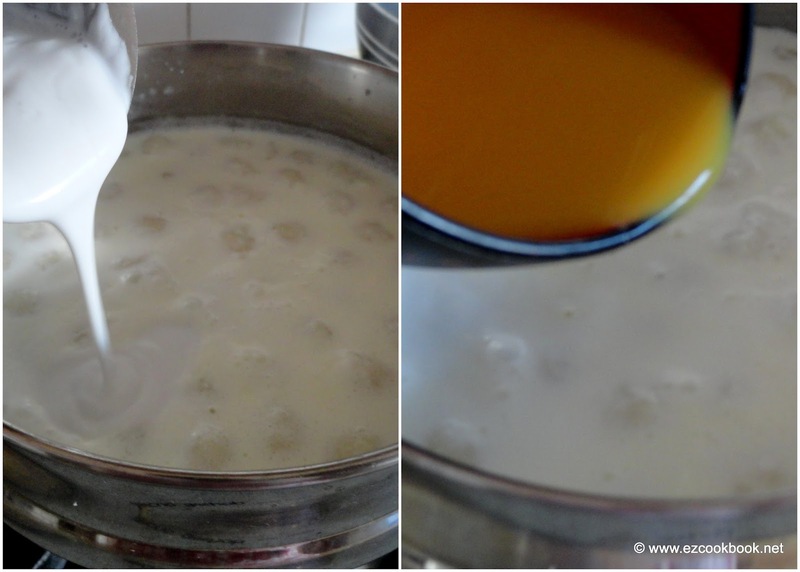 2.Boil 2 cups of water in a sauce pan, add tea leaves, milk and sugar. Let it comes to boiling point. Add a tsp of chai masala(or more to add more spicy) to the boiling tea and reduce the heat to low. Simmer for 5-8 minutes to let the masala flavors incorporate well . 3.Strain the tea into 4 cups and serve hot. I always like my tea to be little thick, so use water according to your tea consistency you prefer to have. Diabetics can substitute with sugar re-placer and enjoy. Chappati Upma is a quick fix recipe to make use of leftover roti / chapati. An excellent idea to turn your roti into upma for an appealing evening tiffin. I would even recommend bachelors to give a try for this upma, as it takes hardly 15 minutes to prepare. Dabeli is a another version of Vada Pav or Burger. It is made with specially prepared spiced potato stuffing filled in a bun along with chat essentials i.e sweet-tangy chutney, hot red chutney and sprinklers like sev, onion, peanuts and pomegranate. It is originated from a Gujarati Region Kutch and very popular as a street snack hence named and famous as a Kutchi / Kachhi Dabeli. Now it has taken same popularity in Mumbai street food as much as Vada Pav. Here goes the EzRecipe to Make Kutchi Dabeli. I find usual flour tortillas a bit unhealthy. So here I tried to make it healthy all healthy flour. It exactly tasted same as corn nacho chips. My family is a huge fan of nachos during movie time..
Now they are happy to get the same feeling at home while watching TV with homemade healthy nacho chips. Try this Ezrecipe to make crunchy homemade nacho chips and stock it up for 1 or 2 weeks. Mexican Tomato Salsa is a popular condiment. It can be served as salad or sauce along with tortilla chips as a snack, or with taco/burritos as a part of meal. Its easy, quick and simple to make and its fresh tangy flavor is a real crowd pleaser. Many like to discard its water but I just love the tangy tomato water which enhance the flavor and make it more delicious. Here goes the EzRecipe to make Authentic Fresh Tomato Salsa. Paal kozhukattai is a famous chettinad sweet that is made with jaggery - milk combination. The special feature of this recipe in which the rice balls/dumplings, so called kozhukattai are prepared by soaking and grinding pasarisi(raw rice). The rice dumplings are boiled in the milk and sweetend with jaggery syrup with the hint of cardamom. This is an authentic recipe of chettinad cuisine and must sweet in any special occasion. 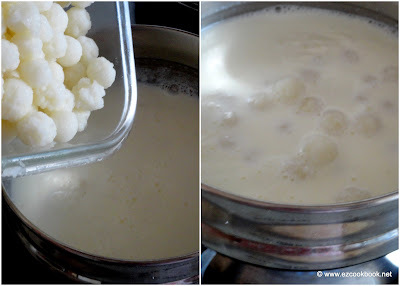 I made this recipe yesterday to offer Lord ganesha on his birthday (chaturti), as he is fond of kozhukattai. Wash and soak rice for half an hour. Grind to smooth paste with just needed water to not struck at the bottom of the jar. Add two cups of water, gingelly oil to the paste and make a thin batter. Transfer the batter to the heavy bottomed vessel and cook on medium high flame. Stir continuously until it forms a massive lump.It should like this in the below. Care while stirring. Boil 3/4 L of milk in a sauce pan. Cool the dough and knead well. Grease hands with oil while kneading and start making small balls out of it. Keep aside. 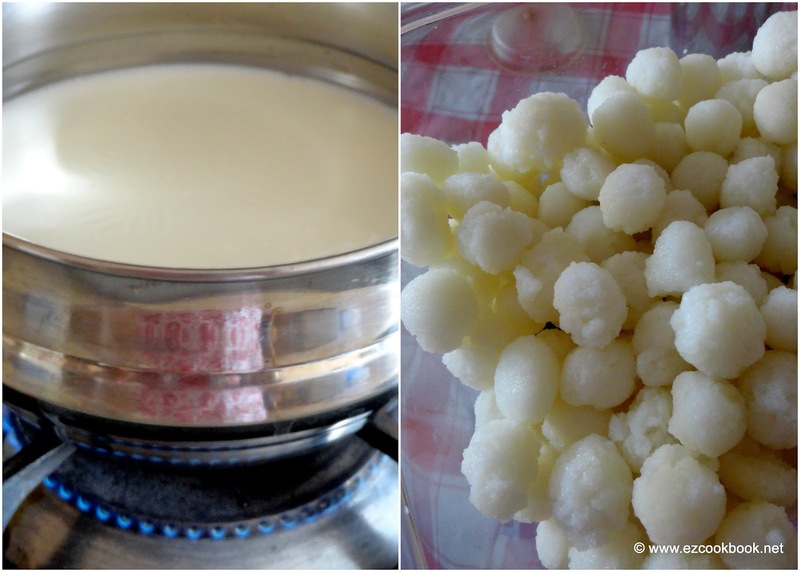 When the milk starts to bubbling add the rice balls and cook over medium flame. It will take around 8-10 minutes to get balls cook completely. Meanwhile warm(do not bring to boil ) the remaining 1/4 L of milk, cool for a while. 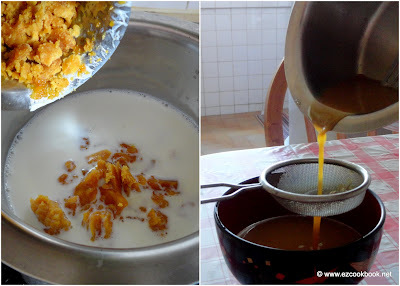 Add the grated jaggery to the milk and dissolve it. Pass to strainer to remove dirt. Keep aside. Now check for the rice balls, if it is done add a cup of thick coconut milk and switch of the fire. Now pour in the jaggery milk and cardamom powder for flavor. Mix well and cover with a lid to incorporate the flavors to get in to the rice balls for 10 minutes. Serve warm in a bowl. There is chances of milk curdling, if you add jaggery directly to the boiling milk. So always remember to add jaggery to any sweets that you make with milk-jaggery based. For variation can substitute sugar instead of jaggery, to make paal kozhukattai. To make more interesting add some roasted nuts and dry fruits. If you are running out of time to soak and grind the rice, use good quality rice flour and follow the same procedure. Just reduce the water to 1.5 cups. Wishing all happy Ganesha Chaturti !!! Check out the recipes, special naivedyam offered to Lord Ganesh on his Birthday Here. And I'm gonna try this for upcoming Indian festival - Vinayaka Chaturthi, as Lord Ganesha is fond of Undrallu /Kozhukkatai/Madak. Let's try something new with traditional. Also check other Vinayaka Chaviti special recipes. A Spicy Indian Vegetarian Burger. Vada Pav or Wada Paav , a popular Indian Spicy Vegetarian Burger. A very hot selling Mumbai-Maharastra, street food, a quick food for rushing weekdays. Pav is actually a bun and vada is basically a batata vada. Batata vada is made out of spiced potato balls coated with besan batter and deep fried. The vada is then clubbed between the pav with some fresh and hot spicy chutneys.